"WHAT WENT WRONG IN OHIO"-BIG D.C. EVENT!! 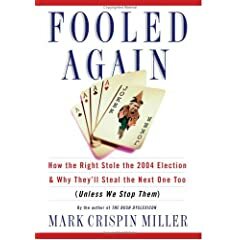 Friends, there will be a Harper's Forum on the theft of the 2004 election, this Thursday morning (July 21) from 8:15 - 10:00 a.m., in room HC-5 at the Capitol in Washington, D.C.
2004, and Why They Will Keep Doing It (Unless We Stop Them). It will be published by Basic Books this October. To RSVP, you must call 212-420-5745 AS SOON AS POSSIBLE!! 1. Anybody got a report? "This week. Hits the newsstands this week. Some subscribers-out West, for instance-have already got theirs." BTW: Freeman's book should be out in Sept, so the Fall should be very strong! I'm trying to get Mark to come over here to chat about this. But he always forgets his password! to Harper's and scribbled back to all the other mags that wanted my money that unless they began to investigate the voting machine scam and con game or at the very least face the facts about it honestly, they would not get one penny from me again. I sent that to Mother Jones among others. Lewis Lapham, the editor at Harper's, treated the vote scam as real from the very beginning. That is, he didn't deny the obvious. Maybe Harper's courage will make for a gradual sea change among the journals that claim to be doing real investigative journalism and revealing scams and con games but in reality have avoided the most obvious of them all. right down to a conclusion that is virtually irrefutable. And it won't matter if that conclusion is just as disappointing for Lefties as Righties. That' just the Harper's way. So prepare to be perplexed as much as vindicated! 10. Praise the Lord, and pass the ammunition. Buyer's remorse has paved the way for this. People are ready to hear it now. 11. Oh, bleever, I hope so. I'm sure she lurks at DU. You guys in ERD have been terrific since the last fraudulent election. The fraud movement is gathering steam. People are starting to realize, and word is starting to spread. Thanks so much for all of your hard work. Maybe with all the Rove stuff going on people aren't afraid of bringing out the truth. Miller is one of the very best media critics out there. I have taught his stuff for years. 18. Any updates/summaries from the forum yesterday? 19. I drove an hour (one way) to buy a copy in Nashville. The cover is AMAZING -- a special fold for the title, followed by three chimps covering their eyes, ears, mouth. Phenomenal article and very well footnoted. I'll post excerpts tomorrow. I can't wait for it to be posted on-line so I can start emailing it around. Thank you MCM. "In this nation's epic struggle on behalf of freedom, reason and democracy, the press has unilaterally disarmed -- and therefore many good Americans, both liberal and conservative, have lost faith in the promise of self-government. That vast surrender is demoralizing, certainly, but if we face it, and endeavor to reverse it, it will not prove fatal. This democracy can survive a plot to highjack an election. What it cannot survive is our indifference to, or unawareness of, the evidence that such a plot has succeeded." I got into a conversation with the check-out person and several people in line about the artilc while waiting to pay for the magazine, and their discomfort was palpable. This tale of the truth of the greatest crime in the history of our country refuses to go away, despite many people not wanting to believe that it -- indeed -- can happen here. And, likewise, those of us in the "reality-based" community refuse to go away. Despite -- just this week -- having our emails fucked with, our Kerry/Edwards signs stolen (mine has been up for ten months, only to be stolen today), our sanity and motives questioned. The mo-fo and his merry band of miscreants and traitors stole it. And, boy, are they going to pay for that lapse in judgement. Republican candidates for Congress (notably in Vermont) running on an impeachment ticket, 85% of Independents opposing Duh-bya's economic plan, etc. The way these fuckers are imploding, we might actually have a chance to win another election, right some wrongs and hang some homegrown evildoers high. 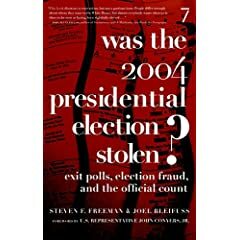 Because it's hard to steal an election when the pro-Repug polls will look in 2006 like Daffy Taft's and SwartzenEnron's do now. 20. Thanx for the paragraph, it was great to hear. I'm gonna hunt for a copy tomorrow. not mentioned in MIller's article. He knows about it and all the exit poll stuff; maybe Harpers only wanted the Ohio info? and it would be great to ask Harper's to do a follow-up story about it. I just found the MP3 of the "What Went Wrong in Ohio" forum at <http://www.harpers.org/WhatWentWrongInOhio.html >.